In one previously publised article, we discussed about relay modules. Relay is the main coil and relay module avoids creating the circuit with basic electronic component making it super easy to work with Arduino. Working With AC Demands Minimal Precaution. Holding a live wire can decrease your lifespan just short – take precaution and on doubt, in real life do not hesitate to get the circuit checked by local electrician. Here is Circuit Diagram & Code to Blink AC Bulb With Arduino Relay Module. Regular readers probably can recall blinking flashlight bulb with Arduino. There can be one to many channels of a relay module. A 2 channel module can control 2 AC bulbs (or something driven by AC). There will be three things printed on AC connection side of relay module – NO, COM and NC. COM means Common Connection, which is the center terminal. Load is connected at this terminal. NO means Normally Open, which acts like a switch, When we will programmatically trigger the relay module, it will connect to COM and supply to the load is provided to power up the light. NC means Normally Closed. It is always in contact with COM. When we will programmatically trigger the relay module the connection will be lost. So it will behave opposite to NO. That property is used in decoration with colored bulbs – if alternative bulb is connected with COM and NO, that will look beautiful without working huge behind the circuit or programming. There will be two things printed on DC connection side of relay module – JDVcc and GND. We will use a 5V Adapter as a separate power supply for this unit. The Arduino’s 5V pin need be connected to the Vcc pin of the module and the pin number 13 (or some other pin) need to be connected with the In1 input pin for controlling the relay. Rest is work with AC bulb and wire. Notice in diagram how the two wires is cut and connected to the common and the normally open pin of the module output connector. With battery power, we made human breathing pattern of lighting like MacBook with Arduino and LED. Can you modify and use for AC LED decoration bulb yourself? With time, we will add WiFi module with this system and control AC Bulb with Android smartphone application. That is basic example of home automation, home IoT etc. This Article Has Been Shared 4350 Times! 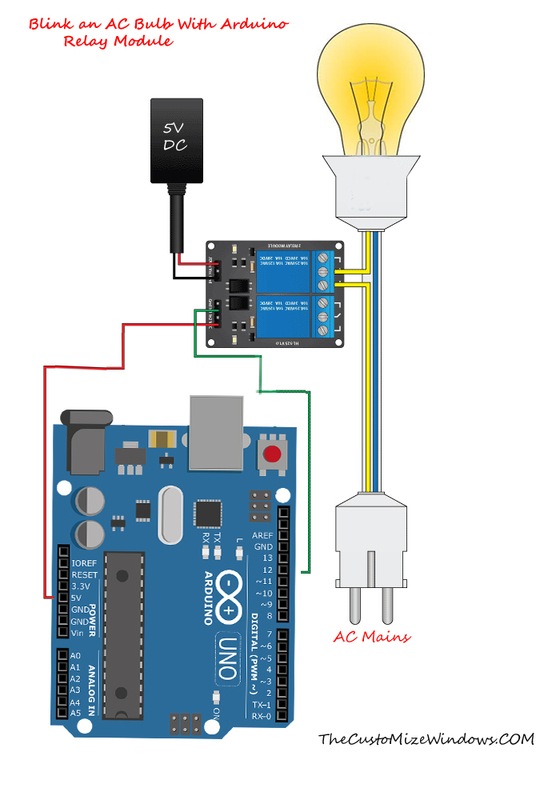 Cite this article as: Abhishek Ghosh, "Blink AC Bulb With Arduino Relay Module," in The Customize Windows, April 17, 2018, April 21, 2019, https://thecustomizewindows.com/2018/04/blink-ac-bulb-arduino-relay-module/.